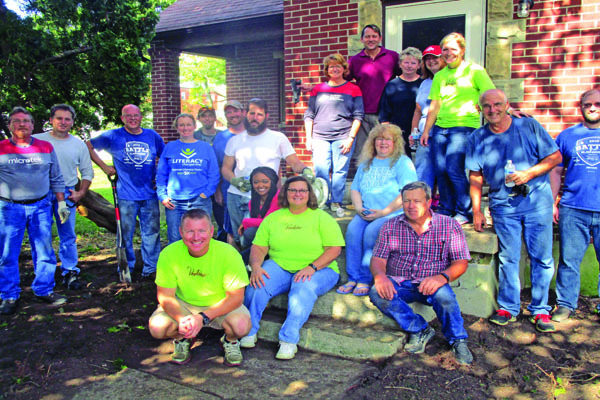 On September 13, eighteen employees from American Thermal Instruments (ATI) on East River Road volunteered and performed extensive yard work at a senior citizens house on Pensacola Blvd. Working in cooperation with the Volunteer Program, ATI employees trimmed and removed shrubs, bushes, tree limbs, weeded flowerbeds, cleared overgrowth, unearthed a sidewalk that was overgrown by grass, removed an old dog house and in general, gave the front, side and back yard an extreme makeover. The Street Division loaded and removed over 400 pounds of tree branches, shrubs and yard overgrowth that was cut down and cleared by the ATI volunteers. the community by working at these events. Since Mrs. Farra had several surgeries the past year and was unable to keep her yard maintained, we were happy to help her and make a difference,” added Wilders. American Thermal Instruments plan to return to Mrs. Farra’s house and install two new bushes in front of her home where two overgrown bushes were removed. “I want to thank George, Jackie, and all of the ATI employeesfor what they did. I am so grateful and blessed that they selected to help me,”stated Mrs. Farra.